Print mixing is something I get asked about a lot. It seems that while many of you like the look of it, you aren’t really too sure how to do it. So I thought that this week I would share some tips to help you print mix like a pro. It helps if one of the prints is bolder than the other as this prevents them competing for attention and is much easier on the eye. A pair of patterned socks or tights is a fun way to add a second print. Accessories are a great way to dabble in a spot of print mixing if you’re not feeling confident enough to wear more than one print. Neutrals such as stripes, polka dots and animal print always mix well with other prints. Picking prints that have at least one common color running through them will help the prints gel. Most stores feature a limited color pallet so you’re sure to find two prints that complement each other in the same store. Picking a color pallet and choosing only prints in this family will help you to pull together a cohesive look. Shoes are another simple and subtle way to mix your prints. Scarves are a brilliant way to test out print mixing, as if you end up feeling a little self-conscious, you can just whip it off and tie it to your handbag. If you’re having trouble deciding which colors to mix together, take color out of the equation and stick to Monochrome – they always work well together. 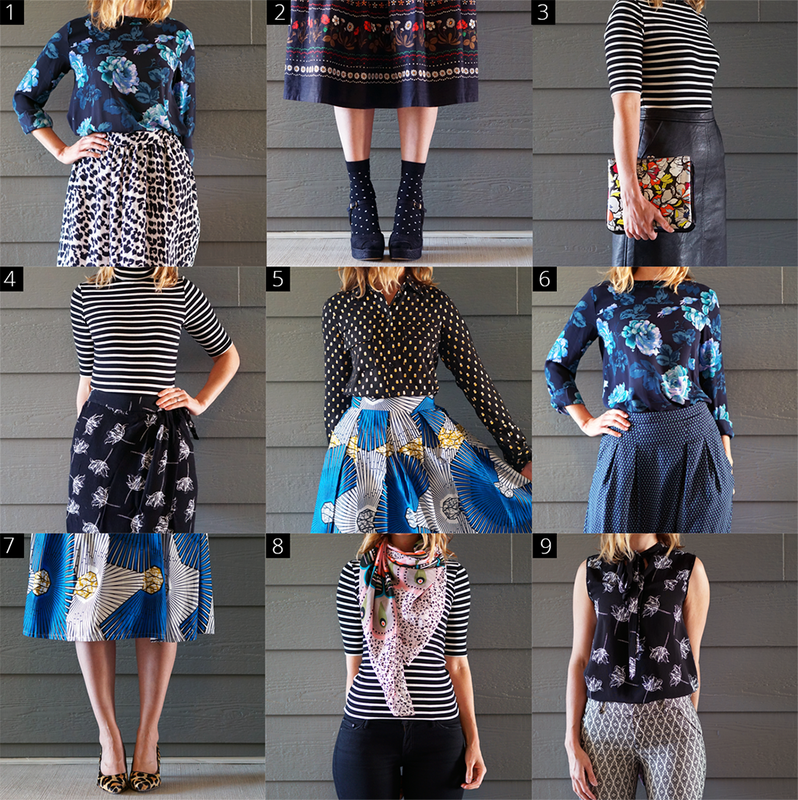 Wear two prints on a different scale. For example, a top in a small polka dot looks fabulous teamed with a skirt in a large spot. Mirror your prints. Sometimes a store will do one print twice, but invert the colors. These two prints will mix perfectly. Use accessories to tie the prints together. A belt in a color that is featured in both prints is a great way to finish off the look. But most of all be confident with your choices and wear them like they were meant to be together.